A Quiet Place is a thriller/sci-fi movie starring a real life husband and wife. This is an intelligent, well acted, empathetic film that makes judicious and limited use of special effects. This is the type of scary yet dramatic film that showcases the best that Hollywood can do when good writing, directing, and acting all come together. Most stories explain or question who we are, why we exist and how will we survive. A Quiet Place does that. 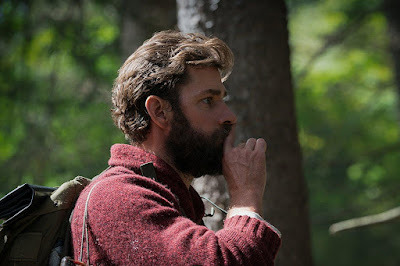 Another thing which A Quiet Place does which is rather unusual in today's zeitgeist is to show equal respect for the different and complementary traditional family roles played by men and women even as the film winks at us by having both men and women step into the other's role during emergencies. A father is no less manly for nurturing his children while a mother protecting her family can be just as dangerous as any man and yet still feminine. The film focuses on a small number of characters in a limited environment, but the viewer never feels bored. This works because this isn't just a monster movie. This is a a drama about a family. The quirk was that a family that has a tremendous amount of pain, love, and other primal emotions to share can't speak to each other. Now for someone like me who tends to think that most people talk way too much anyway, this would initially sound like a pretty good idea. This enforced silence isn't because of a monastic vow. No the reason that the Abbott family (and doesn't that remind you of a religious community) must live in silence is that about three months prior to the time of the movie's opening events, Earth was attacked by sightless aliens who above all else hate sound. The aliens kill anything they hear. The aliens have wiped out much of human life on the planet. These aliens, which are wisely kept off screen for much of the film, have natural armor that renders them virtually impervious to most human weapons. This doesn't make sense. Humans have tools and weapons that can penetrate two feet or more of modern tank armor and/or melt steel. The movie imagines that humans armed with rifles that can reach out and touch something at a muzzle velocity of over 3000 ft/second are helpless against creatures with an exo-skeleton that can't be more than two or three inches thick. Although the film doesn't delve too deeply into it, wouldn't the aliens want to exterminate such clamorous animals as birds and insects? The Earth can get along without humans but without certain birds and insects the entire food chain would be altered. And without pollination certain flowers, trees and other plants would die off which would alter the atmosphere and land and eventually wipe out almost all higher life on earth. But maybe that's the sequel. We shouldn't get bogged down in logical or physical impossibilities. Just enjoy the film. A year or so after an opening tragedy, give or take a few months, the Abbott family, Lee Abbott (John Krasinki), his wife Evelyn (Emily Blunt) and their children, daughter Regan (Millicent Simmonds) and son Marcus (Noah Jupe) have found refuge at a farm. The Abbott family, despite the aforementioned tragedy and occasional blunders, seems to have been better situated than most to adapt to this new lifestyle. Both parents are handy and astute. The parents ensure that everyone walks barefoot. They have marked squeaky floorboards in the home so that they're easy to avoid. They use plates made of vegetables. They air dry their clothes outside, something that acts as sound baffles for the house. But the most important thing they do to reduce sound is to use sign language to communicate. Regan is deaf and has been since birth. (The actress playing Regan is deaf in real life.) But the family is at a crossroads. Evelyn is pregnant. And babies aren't quiet. There are many things that the family needs to SAY to each other but they can't afford to risk speech. 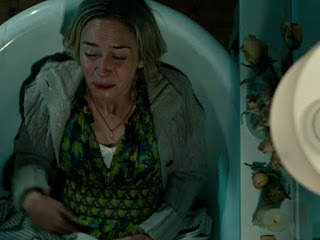 A Quiet Place is not about space aliens or violence because as I wrote, those things are mostly off screen. The film's real story is centered on a family's struggles to stay safe, festering misunderstandings, and how parenthood at its best is an act of optimism, faith and sacrifice. As most of the film is silent, the four characters have to work to connect with the viewer. I think they do. We display so much information via our facial expressions and body language. This was one of 2018's better movies. You should see it. Beautiful cinematography and smart tension that is constantly tightened make this a film you'll remember.